Catherine Taber has voiced many Star Wars characters over the years although she is most well-known as the voice of Padmé Amidala in The Clone Wars film, TV series, video games, and Forces of Destiny. She has voiced several other female characters in Star Wars video games including Mission Vao in Knights of the Old Republic, Princess Leia in The Force Unleashed, and Vette in The Old Republic. She was the voice of Numa in both The Clone Wars and Star Wars Rebels and Taber was the voice of a Hangar Officer and a Starkiller Technician in The Force Awakens. She was kind enough to answer a few questions via email for 365 Days of Star Wars Women. A long time! I definitely credit that as a huge factor in the roles I have gotten. Knowing and loving the Star Wars “world” was an asset for me from day one. How did you get into voice acting? 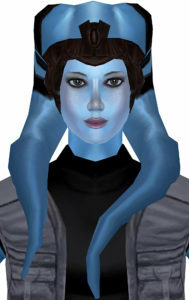 Is it true that Mission Vao in Star Wars: Knights of the Old Republic was your first voice acting role? I actually fell into voice acting after a talent agent suggested it because he said I was well spoken and knew I could do accents. I was just pursuing on-camera acting initially, but then got a meeting with a great voice agent, Sandie Schnarr. She decided to take a chance on me and Mission Vao was my second voice over audition. I think the first was a commercial for Papa Johns Pizza, which I did not get, but thankfully Darragh O’Farrell of LucasArts also took a chance on me! So yes. Mission was first VO role and my first venture into that far away galaxy, but not my last! You have worked on both TV series and video games. How is the process different in a video game as an actor? Do you enjoy working in one medium more than the other? With video games you are usually in the recording booth by yourself, and for TV you more often record with other actors. They both have some benefits. With video games I have had the opportunity to have some major in-depth character arcs because of the large amount of content. But I do really love being in the room with other actors and having that chance to play off one another. Although now some video games are starting to record that way as well, which I think is such a good move. It adds so much more life to the performances, but it can be really hard to coordinate schedules! A lot of fans associate you mostly with Padmé Amidala since you portrayed her for so many years, but you’ve also voiced Leia and many other Star Wars characters such as Numa in Star Wars Rebels. What was it like in 2008 voicing both Leia (for the video game The Force Unleashed) and Padmé (in the Clone Wars feature film)? Did you approach these roles in different ways? 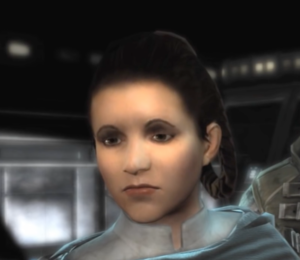 They initially were having a hard time casting teen Leia in TFU, but I didn’t read for it initially because the Game team, which was totally separate from the animation team, knew me actually more as Mission Vao, but I finally got the call to give her a shot and I just felt I knew the character so well, her speech patterns for that timeframe in Star Wars, her personality so I was so excited for the opportunity…and then thrilled to book it! I always think of Leia as a combo of Anakin and Padmé…she can have Padmé’s grace and royal countenance but she also has that super fiery and impetuous side that comes out and she is less able to control that then Padmé, in that for better or for worse I think she favors her father. Also, I have already outed myself that I did my hair in Leia buns and wore white for my audition, even though it was just done via audio over phone patch…but I secretly believe that made the difference! Do you have a favorite Leia and/or Padmé episode or project you worked on? Well you haven’t gotten to see Star Wars Detours yet, and I sure hope you all do someday. But I play a teen Leia in that and it is a comedy. It is so smart and funny and full of inside Star Wars jokes and lore and the whole team making it was just a dream, so I loved that project! Padmé is still my favorite character and I really loved so many Clone Wars episodes it is hard to pick a favorite…I love episodes from the beginning like “Destroy Malevolence” all the way to THE last season with the Clovis Arc. 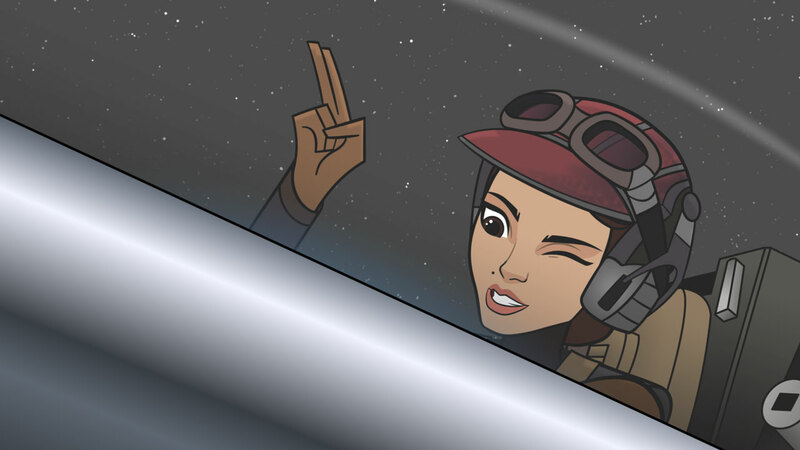 Were you surprised there was going to be more Padmé content when you were approached about Forces of Destiny? I think as an eternal optimist I always hope for more Padmé content so I am not sure I was surprised, but I was for sure thrilled. I will never get tired of playing Padmé. 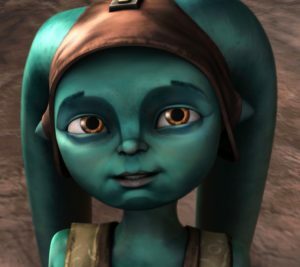 Numa in The Clone Wars. Favorite Star Wars character you have voiced that’s not Leia or Padmé? Any Star Wars character you would love to play? Numa! I LOVE Numa and was so happy Dave Filoni brought her back for Rebels. I would still love to see more of her story and life explored. As for others, no specific character, but I would still love to play a Jedi who wields her own lightsaber, especially if I got to do that in live action. I am kind of already training…you know just in case the need arises someday! Favorite non-Star Wars voice role and acting role in general? Oh boy that is hard…I love so many of my girls! Penelo from Final Fantasy, Jesse from Minecraft and Lori Loud on the Loud House are stand out. And I got to play a great character and do some of my own stunts in an indie feature coming out this year called Haven’s End and I really enjoyed that too. I would love to do more actiony stuff…its just really fun! And on the opposite end of the spectrum, I had the chance to work on the audio version of an amazing best selling book last year (it’s such a great story!) Before We Were Yours by author Lisa Wingate with another now favorite character, a 12-year-old girl named Rill. Basically, I love my job! Can you tell me a little about your experience working on The Force Awakens? It was an amazing day. Matthew Wood who is not only the supervising sound editor for the Star Wars films but also General Grievous brought some of us Clone Wars Alum together and gave us the chance of a lifetime. We got to play together AND work on The Force Awakens. It doesn’t get much better. Well, as I mentioned I am excited about Haven’s End and am continuing to work on The Loud House, we just found out we are renewed for out 4th season! There is not much else I can say yet….just as always stay tuned! Are you still working on Games for Soldiers? If you’d like to tell readers about this program I can link to the website and include any information you’d like to share. Thank you so much for including me in 365 Days of Star Wars Women, Amy! It has always been one of my favorite things about the Star Wars Universe that there are so many amazing female characters, representing all different types of women, culminating most recently with Forces of Destiny, made about female characters, and written and co-produced by strong talented women like Jen Muro and Carrie Beck. Although there is always room for improvement and evolution (for all of us I think! ), from the beginning, with our beloved Carrie Fisher as Princess Leia, for me personally, Star Wars has been a place where strong women hold there own with, work together with and appreciate strong men, and with more new movies and series on the way, I am looking forward to seeing this continue. May the Force be with us all! You can find Catherine Taber on Twitter @cattaber.